In June 1996, Eliot Levin of Symposium Records was busy transcribing all the existing Phonovision records for the National Museum of Photography, Film and Television. In conversation with a friend, Dave Mason, it transpired that Dave had in his collection a highly corroded privately-recorded aluminium disc with ‘Television 1933’ tantalizingly written onto the label. Eliot took great care in transcribing the disc and passed the copy over to me. With great excitement I restored and repaired the latent image on the disc over the following few weeks. From the unique characteristics of the 30-line signal recorded on it, I was able to verify that it was a recording of a BBC transmission on the Baird 30-line system. But why the excitement? The images on the disc are a revelation for our understanding of 30-line television. From a highly-damaged disc of a recording made at the original owner’s home in Ealing using domestic equipment connected to a domestic wireless receiver tuned to the BBC’s vision transmission in the Medium Wave band, we now have four minutes of recognisable and entertaining television. This is completely contrary to our conditioned expectations on these 30-line transmissions. As you might expect, the person who recorded this disc was selective about his video recording. 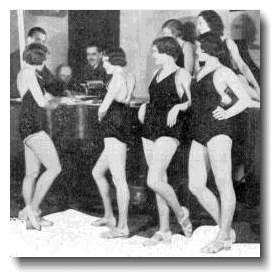 He chose the first television revue – called “Looking In” – with the Paramount Astoria Girls who performed in April 1933. We have been told that 30-line transmissions were uninspiring with stilted presentations to the camera and highly limited in content. (Update in 2013 – and we’re still being told that. I guess the media researchers haven’t found this website or read Bridgewater’s ‘Just a Few Lines’) The programmes were also supposed to be so poor in quality as to be unwatchable. Never mind that by 1935, the number of 30-line receivers throughout the country were numbered in their thousands. And all for a half-hour broadcast just before mid-night each night. Now with the Silvatone record we have evidence of an entertaining and innovative service which was slick and professional geared to the limitations of and making the most out of the 30-line Baird TV system. The production staff were BBC professionals – what would you expect? 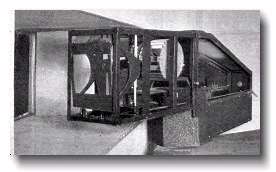 The equipment used to capture this television transmission for posterity was the ‘Silvatone’ system. In late 1930, if you had had 4 pounds 12 shillings sterling (about $25 in those days! ), you could have bought a home recording system. 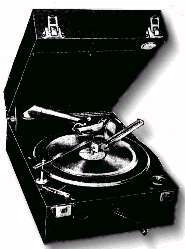 Made by Cairns and Morrison Ltd of London, the machine allowed you to record via a microphone onto a 7 inch aluminium disc at 78 rpm. The price included six blank discs which could be recorded only once. The intention was to play this back on your own standard record player. You had to fit a special soft stylus (fibre) instead of the steel needle in order for the disc to be played back more than once! 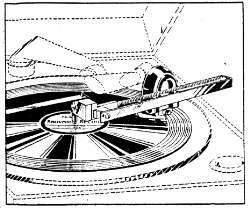 Compared with the professional recording systems of the day, the quality was poor even for speech quality yet suitable for home entertainment as a novelty, and NOT as a replacement for professionally recorded 78s. WILL ONLY PLAY WITH FIBRE NEEDLES. MANUFACTURED BY CAIRNS & MORRISON LTD.
Disc OD (Outside Diameter) 25.4cm, Groove OD 23.8cm, ID 10.75cm. Duration 3min58sec. 121 tpi. 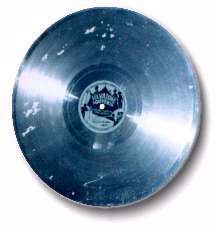 Aluminium disc, recorded on one side only. A privately-recorded disc of the 30-line television signal was discovered in June 1996. I have restored the contents and have discovered that this is a highly important recording in the history of television. The highlight of the recording is a dance sequence from a group of chorus girls who turned out to be 6 members of the Paramount Astoria Girls. So this recording is the Earliest (dateable) Recording of Broadcast Television and it’s four minutes of vision from The World’s First Television Revue. Where and how was it transmitted? Regular broadcasting on the 30-line service had started on 22nd August 1932. Initially, transmissions were made every weekday (except Thursdays) around 11pm after main audio transmissions had completed. The shows lasted only 30 minutes. They were made live (of course!) with one mirror-drum camera in Studio BB in the basement of BBC Broadcasting House in the West End of London (until 1934 when it moved to larger facilities at Portland Place). The studio was small and the single camera was a major challenge. Imagine making a 30 minute programme with your own cam-corder. It has to be fixed on a tripod so you can’t move it around. You can only pan it (the mirror-drum camera could not tilt). You can’t use zoom. In the BBC studio, the camera and lights were reversed from conventional film cameras. 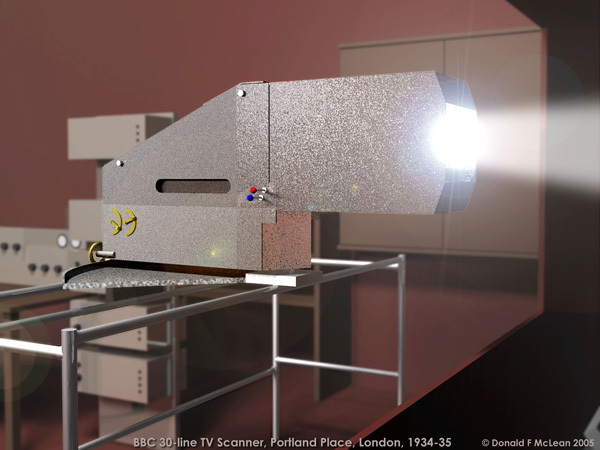 The camera was a scanning projector using an arc-lamp and mirror drum that sprayed a fine spot of light on a 30-line raster into the studio. Where the lights would normally be were banks of photocells that picked up all light in the studio, most of which was coming from the reflection back of the travelling spot of light from the scanner, shown below. I found this photograph by accident just a few days after the restoration was complete and immediately recognised the dancers as those on the restored 30-line programme. I asked Ray Herbert that very day who the girls were as there was no caption to the photograph, and he said the Paramount Astoria Girls. The BBC Written Archives Centre at Caversham found the only date in 1933 – 21st April 1933 – that fitted and retrieved the “Programme as Broadcast” schedule listed here. Text reproduced with kind permission from the BBC. The ‘Television’ magazine of May 1933 carries a review of this programme. It turns out that this programme was the first ever television revue and attracted a lot of attention at the time. Now we see why it was this programme that was chosen to be recorded – this was a television special. The review says that first on were the Paramount Astoria Girls. This means that the 4 minutes of the disc were recorded right at the start of the programme – at the start of the recording there is the caption, then 5 individuals, then about 90 secs after the caption, the Girls. From the programme notes above, there were only 5 in the cast other than the Girls. My interpretation is that those 5 appear on the disc introducing themselves right at the start of the programme – hence the ‘video-bite’ appearances described below. What is on the disc? With the dancers exiting stage right, the scene is blank for around 8 secs. A woman with a squared-off head-dress appears into shot for about 6 secs and is cut-off by the end of the disc. Here, we have appearances from 11 or 12 different people within the space of 2 minutes followed straight-away by a 1min 20sec dance piece. Each of the performers or presenters are on for no longer than 20 seconds. These pieces are long enough for the people to be recognised but not so long that the viewers get bored. This is unique to 30-line television as neither radio nor film worked in this way at the time. The single studio camera meant there was no possibility of cuts between shots. The curtain we can see hanging down in the head and shoulder shots provides a false background allowing the studio behind to be re-arranged. This ‘courtesy’ curtain hangs down to the performers’ waist-level. The performers enter and exit not from the right or left but from below, from underneath the curtain. The camera could not tilt (hence we know the relative height of the performers). In the dancer sequence, we can see the camera pan – in fact ‘hosepipe’ – across the dancers. What is not apparent on the recording was that the ‘camera’ and lights were reversed. The ‘mirror-drum’ camera projected a flying spot of intense light across the studio and four banks of photocells (where the lights should have been) picked up the reflected signal. The studio was therefore in darkness apart from a brilliant flashing light in the performers’ eyes. This is a four second fragment or about one sixtieth of the 1933 recording showing the Paramount Astoria Girls. The scene has been reduced in quality for the web. The disc has been completely processed and the results were released in 1996 to the National Museum of Photography, Film and Television (now the National Media Museum), in Bradford, UK for a new exhibit. The first public display of the images was at IBC 1996 Amsterdam on the NMPFT stand. A few days later, I premiered the images in the UK at the British Vintage Wireless Society convention in Harpenden on 21st September 1996. The pictures were broadcast by the BBC around the time of TV60 – the 60th anniversary of “High Definition” Television on both Tomorrow’s World and Horizon (“TV is dead, Long Live TV”). A few weeks after I completed the processing, I made it a priority to show the results to ‘Tony’ Bridgewater OBE, then very ill at a nursing home. Tony joined the Baird Company in 1929 and transferred over to the BBC with the experimental 30-line system as one of the three television engineers in the BBC. He was probably involved in the transmission on the disc although he had no recollection of it. This was however the first time he had seen a BBC 30-line programme since it was transmitted. He told me he found the imagery ‘very nostalgic’. Some eight months after that meeting Tony died at his nursing home.